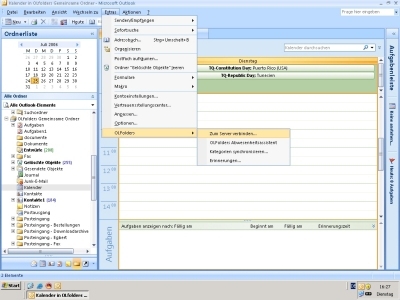 Outlook team work - Microsoft Office Outlook 97 to 2010 (32 or 64bit) network solutions without or in connection with an Exchange Server. OLfolders allows the common real time access to all folders in your Outlook network without a complex network Server. Install OLfolders simply central on any Outlook Workstation in your Network and you work simultaneously "everyone with everyone" in your network. ...... other clients to connect to the data remotely. Access can be restricted by user rights to certain profiles, files or folders inside a file. The server can run either on a dedicated server or on any works station or notebook; more than one server can be installed in a network. Starting from 2 up to unlimited clients can connect to data stored on the OLfoldersServer. OLfolders can co-exist perfectly in an existing MS Exchange environment, for example to create additional shared folders for a group or project and without loosing the connection to Microsofts Exchange Server. For offline access, data can be replicated using our add-on QSynchronization a synchronisation program for Notebooks. An integrated mail server handles the internal and external mail transport. OLfolders 2006 - Award and Innovation price for Office communication in Small and Medium-Sized Enterprises (SME). Qweas is providing links to OLfolders 3.2 as a courtesy, and makes no representations regarding OLfolders or any other applications or any information related thereto. Any questions, complaints or claims regarding this application OLfolders 3.2 must be directed to the appropriate software vendor. You may click the publisher link of OLfolders on the top of this page to get more details about the vendor.